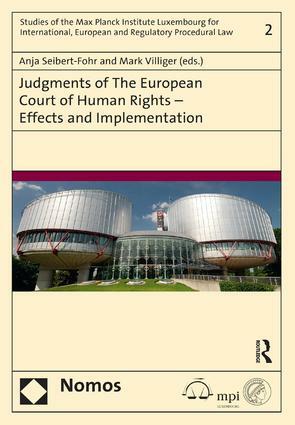 This volume deals with the domestic effects of judgments of the European Court of Human Rights as a challenge to the various levels of legal orders in Europe. The starting point is the divergent impact of the ECtHR’s jurisdiction within the Convention States. The volume seeks new methods of orientation at the various legal levels, given the fact that the Strasbourg case law is increasingly important for most areas of society. Topical tendencies in the case law of the Court are highlighted and discussed against the background of the principle of subsidiarity. The book includes a detailed analysis of the scope, reach, consequences and implementation of the Court’s judgments and of the issue of concomitant damages. At the same time the volume deals with the role of domestic jurisdictions in implementing the ECtHR’s judgments. Distinguished Judges, legal academics and practitioners from various Council of Europe States are among the contributors to this volume, which succeeds in bringing divergent points of view into the discussion and in developing strategies for conflict resolution. Anja Seibert-Fohr teaches international law, human rights and constitutional law at GÃ¶ttingen University. She is a member of the UN Human Rights Committee and formerly directed the Minerva Research Group at the Max-Planck-Institute for Comparative Public Law and International Law. She has published widely in international human rights, international and comparative law. Mark E. Villiger is a judge at the European Court of Human Rights (since 2006), section president (since 2012); professeur titulaire at the University of Zurich (Public International and European Law); Doctor of Law. He is author, inter alia, of 'Commentary on the 1969 Vienna Convention on the Law of Treaties' (2009).